In what does medical care to a dog bite injury consist? And how exactly does the doctor care for the wound? Will stitches be required? Does that mean that a large wound will just be left open? What has to happen in case of a bone infection contracted from a dog bite injury? Is it possible that a dog bite infection will lead to an amputation? How do you know that you contracted an infection after a dog bite? As true as for any other injury the doctor will first check whether the tetanus vaccination is up to date. In certain geographical areas it will also be necessary to administer a rabies vaccine if a patient incurred a bite wound from an unknown animal. A bite wound, regardless whether from a dog, cat or any other animal should never be stitched up! 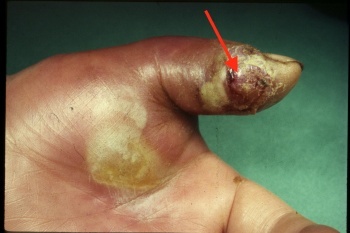 The image shows intense reddening after wound sealing. A wound inflicted by a dog bite (or more specific: any bite) should never be sealed off in a conventional way as it may apply for other wounds. 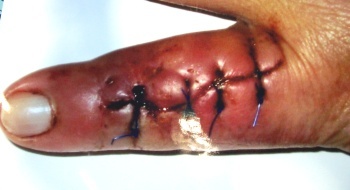 The frequently lacerated wound margins require debridement. In case there are tendon or bone injuries, these too require tending to. Even large wounds inflicted by a dog bite will not entirely be sealed off. The wound margins will be positioned for adaptation through sutures. It is important to leave enough space between the individual stitches to allow drainage of the wound exudate and, if applicable, pus. Only by properly draining off any suppuration can the accumulation and spreading of pus within the injured hand be avoided. The injury looks very small on the surface; however, it runs very deep. Penetrating bacteria contracted through the dog´s saliva can now spread out at very fast pace causing for the infection to propagate quickly. Such bone infection, in medical terms referred to as osteomyelitis, is not uncommon when dealing with dog bites. If a bone gets damaged as a consequence of a dog bite, the entire infectious bone tissue has to be removed as well! Only by rigorously removing all affected bone tissue can a patient be kept from experiencing a relapse after initial positive course of the convalescence. Unfortunately in isolated cases this may happen. The best protection against an amputation of a hand in case of an incurred dog bite to it is early treatment! In situations like these it is justified to proceed to a surgical approach as soon as there is the slightest suspicion of an underlying deep infection. In case of doubt the surgical approach which may be supported by the administration of antibiotics is always the better option in comparison to a “wait-and-see” approach. Truly reliable evidence of a deep-laying infection after incurring a dog bite injury may become obvious only at a very late stage of the development. The same is true for any evidence gained through blood work. A few hours into the incident, that brought you the dog bite it may look like the discomfort recedes. If, however, the pain returns stronger and if you experience a throbbing discomfort at night time, this may already be an alarming sign for a progressing infection. Further signs for an underlying deep infection may be an unnaturally strong pressure pain in the area of the bite wound and an increasing swelling.